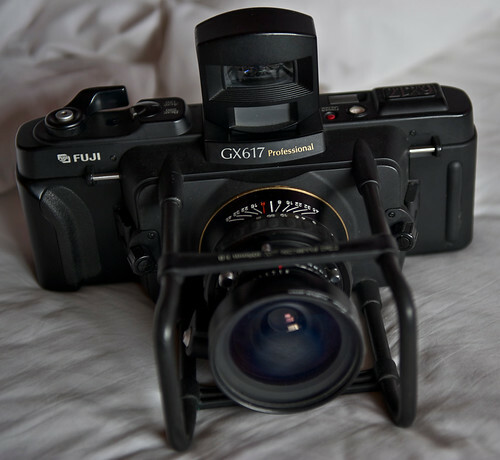 The Panorama GX617 is a medium format roll film panorama camera introduced by Fuji in 1993. It replaced the Fuji Panorama G617 released in 1985. The camera features interchangeable lenses and corresponding viewfinders. The lenses can be switched between a 90mm f/5.6, 105mm f/8, 180mm f/6.7 and 300mm f/8 lens modules. The lens shutters are based on a Copal 0 design with speeds of 1 to 500 of a sec. Each lens has controls for aperture, shutter speed, focus and shutter cocking. Each setting has click stops, and may not operate properly if set in between stops. There is also electronic flash with a pc sync connector on the lens. It is able to sync at all speeds. Though interchangeable there are no provision for mid roll lens changes. Photos are captured in a 6x17cm format onto 120 or 220 film. 120 film yields 4 exposure while 220 produces 8 exposures. The film transport uses a four stroke film advance lever. The film advance lever is locked until the release button on top is pressed. Changing film formats require rotating the format selector on top of the cameras as well as unlocking and flipping the pressure plate on the camera back to select the correct format. The film door is downward hinging instead of the traditional side hinge. Unlike many similar format panoramic cameras it remains attached to the body. 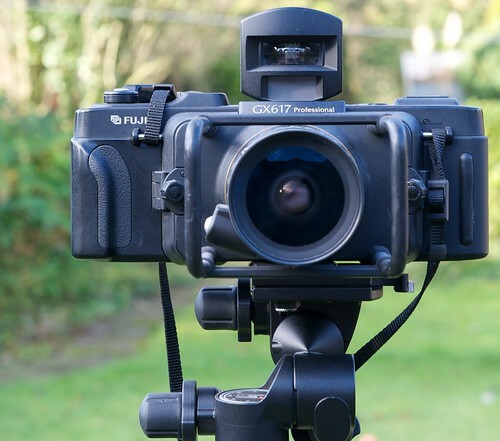 With the back off, a ground glass accessory can be inserted for more accurate focusing. There is a spirit level on the camera top. The camera has strap connectors on the front of the body sandwiching the lens mount. There is a electromagnetic shutter release that requires power to operate. This can only be used for electronic release and does not function for bulb mode. To use longer exposure bulb mode, use the cable release or shutter release beside the lens. Power is with two CR123A batteries located on top plate of the camera under the nameplate. This page was last edited on 2 June 2015, at 02:44.